Gone are the days of the 9-5 job, and technology-free vacation and sick days. Now there are many ways to stay connected to your job at all times. Home computer setups, laptops and smartphones have definitely changed the way we work. It’s great to be able to take care of business at home, or on the road, but how do you decide when it gets to be too much? One in three workers says a healthy work-life balance is becoming more difficult to maintain. With all of the advancements we’ve made in modern technology, it’s no surprise that we sometimes don’t know when it’s time to unplug. With so many ways to check in with the office, we sometimes forget to relax. Do you ever leave work, go home and instantly turn on your laptop to continue to work on a project, or check your phone as soon as you park your car, to see if any new work emails have come in? You’re not alone! To avoid burnout, it’s important to take some time to relax at the end of the day. One problem many face is taking work home in the evenings. Of course, it’s going to happen from time to time. Deadlines loom and things need to get done. Sometimes you have to do some extra work at home for peace of mind, but what can you do to decrease this? Do your best to manage your time effectively during the day. Spend less time scrolling through internet news and chatting at the coffee machine and really do you best to focus on the task at hand. The less you procrastinate, the more you can accomplish during your work day and the closer you will be to having a relaxing evening at home with your family. 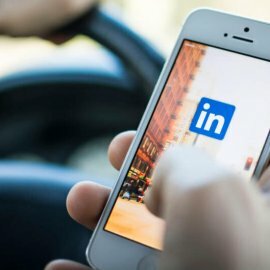 Many workers feel too guilty to completely disconnect from their jobs while on vacation. You care about your career and want to put your best foot forward, while also being accountable for your production. You also care about your team and don’t want to leave them to struggle with extra work while you’re gone. 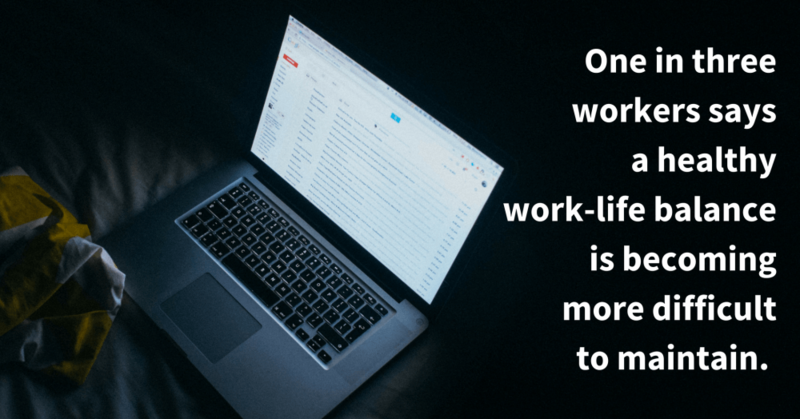 Not only that, but leaving emails unread can have you coming back to a mess after vacation. But the truth is, you really should be able to take some time for an actual vacation once in awhile. 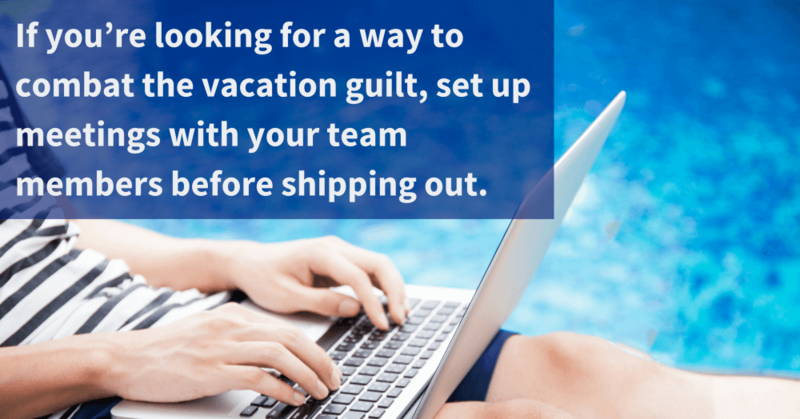 If you’re looking for a way to combat the vacation guilt, set up meetings with your team members before shipping out, and catch them up on your current projects so they can be prepared to deal with anything that might come up while you’re away. In addition to a having one meeting before vacation, start a weekly check-in so you’ll have an overview of what your team is working on. For example, my team meets three times a week, just to update each other on where we are with our job orders, etc. It helps to know what my colleagues are doing in case of someone’s absence. As long as you set up some time which each coworker so they know your status on projects and what will need to be accomplished during your vacation, then you should feel comfortable leaving work with them. It’s important to hit your goals and deadlines, but it’s also important to know that some things can wait. There will always be more to do, so you must find a cut off to keep your sanity! Make a to-do list of things you want to accomplish for the day and arrange it in order of priority. Try your best to get the first 5 things done and then move onto the rest of the lesser priority items once those more pressing things have been crossed off. If you don’t get to something before your workday is done, depending on the specific project, it can be okay to leave something for tomorrow! It can actually work in your favor to save something for the next day, because if you are rushing to finish a task toward the end of your day, your work might get sloppy. 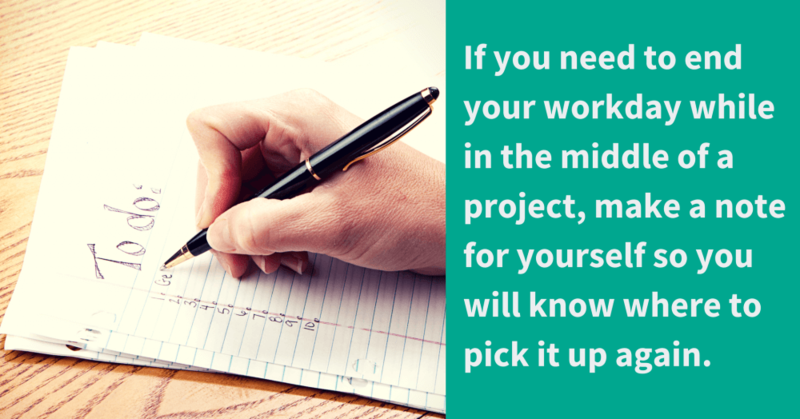 You want to devote adequate time and care to your work. If you need to end your workday while in the middle of a project, make a note for yourself so you will know where to pick it up again when you come back into work the next day. If you find that you are having a hard time getting all of your tasks completed during work hours, remember that it’s okay to ask for help. Your employer and team want you to succeed, so don’t hesitate to talk through your roadblocks with a teammate. They might have a suggestion on how to be more efficient with the task at hand, or they may be able to step in and take a thing or two off your plate. Do you spend countless hours during your workday searching for top talent to fill your open positions? Perhaps it’s time to contact a recruiter! We can help take the busy work off your plate so you can be free to focus on other responsibilities. We use our database and resources to find the best candidates and then only send you qualified talent. You won’t have to waste time scouring the internet for workers and pouring over resumes. We do all that for you! This can really help free up your schedule for other projects and, in turn, help your work/life balance. Visit our website to learn more about how Alliance Technical Solutions can help you save time and money. Chances are you will enjoy your workday much more knowing that when the workday is done, you can take time for yourself, your hobbies and those you care about. Remember these tips when assessing your own work/life balance!